WHAT: ROMAN WRECK WHERE: GODAVAYA, SRI LANKA | EXCAVATION: 2012-PRES. | DATE OF WRECK: 1ST -2ND C. B.C.E. The Godavaya shipwreck was discovered by local fishermen B.G. Preminda and Sunil Ratnaweerapatabandige who, in 2003, found a small stone quern or bench and brought it to the attention of officials from the Department of Archaeology. In 2008, divers from the Department of Archaeology and the Maritime Archaeology Unit (MAU) of the Central Cultural Fund (CCF) conducted a brief exploration of the site and took preliminary measurements, captured video footage of the area and raised artifacts, including ceramic bowls and a hemispherical blue glass ingot. Carlson traveled with INA Archaeologist Sheila Matthews in December 2010 to the south coast of Sri Lanka where they were joined by Dr. Osmund Bopearachchi of the Centre National de la Recherche Scientifique (CNRS) in Paris, and by Dr. Mehendale. Carlson and Matthews completed two dives on the Godavaya shipwreck during their stay, locating the site at a depth of approximately 33 m (110 ft) and identifying nearby glass ingots, stone benches and ceramic bowls associated with the wreck. Numerous digital photographs were taken of the wreck and artifacts and several wood samples were collected for radiocarbon analysis, providing a working date for the shipwreck in the last two centuries B.C. or the 1st century A.D. The first season of full-scale excavation of the Godavaya shipwreck was launched in 2012-2013 with a collaborative, multinational team of two dozen students and maritime archaeologists from the United States, France, Sri Lanka and Turkey who worked under the guidance of field directors Matthews and Trethewey. The project also benefited from the assistance of Mr. Ariyaseela Wickramanayake, who owns the island’s largest marine maintenance and salvage company and who supplied the team with a barge from which to work, SCUBA cylinders, a compressor and a recompression chamber, all at no cost. The wreck, while still in the initial stages of excavation, is probably the oldest known shipwreck in the Indian Ocean and fieldwork has revealed that the ship was transporting a cargo of raw materials, including what appear to be ingots of iron and others of glass, as well as finished stone querns and ceramic bowls. Carlson, D.N. 2011. “INA in Sri Lanka: Pearl of the Indian Ocean,” INA Annual 2010:89-95. Carlson, D.N. and K. Trethewey, 2013. 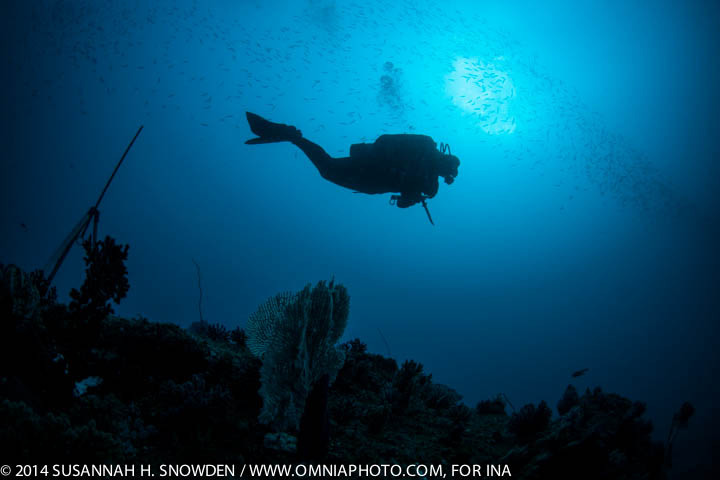 “Exploring the Oldest Shipwreck in the Indian Ocean,” INA Quarterly 40.1: 9-14. Trethewey, K. 2012. “The Oldest Known Ship in the Indian Ocean,” INA Quarterly 39.1-2:28-29. 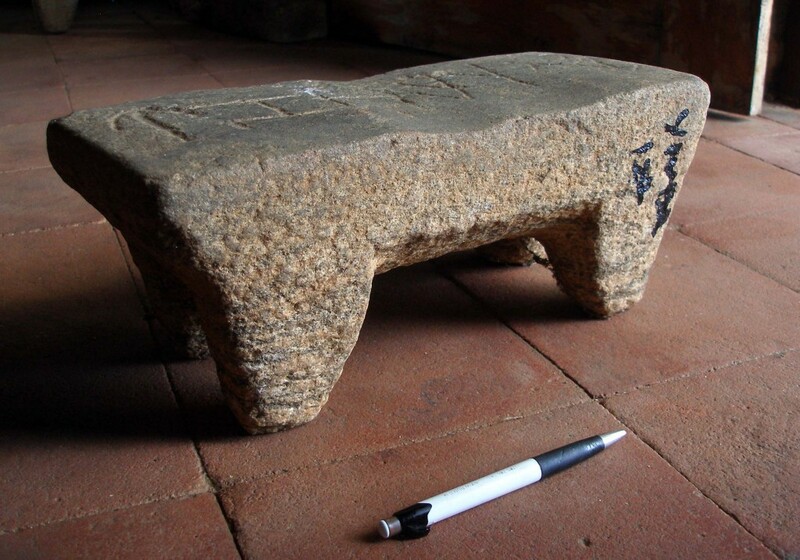 ABOVE: An inscribed stone quern or bench in the museum at Tissamaharama (Photo: INA).